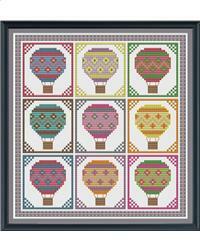 If you love the peaceful nature and bright colors of a hot air balloon, then this pattern is for you. There are nine brightly colored balloons in this easy design waiting to come to life on your fabric. The design comprises whole stitches and backstitch, and the pattern is suitable for all abilities. Project Size: 7" x 7"